How much does it cost to ship this item? Orders over $149 will ship Free to the 48 States. If your order is under that amount, you will be able to use our real-time freight calculator on our website. By pressing the “Buy” button on an item and input your zip code, you will get real-time rates of what it will cost to ship the item or items. How long does it take to get my parts? This really depends on whether the item is in stock and what shipping method you choose. See the map for an idea for standard transit times. Do you ship Internationally? Yes, we ship worldwide everyday (Free shipping does not Apply). Are duties and taxes included in your International shipping quotes? No they are not. You will need to check with your local government agency for clarification of taxes and duties. Most countries do have some exception for parts for Antique Auto Parts and these shipments will be labeled accordingly. Will I be able to track my package? Yes we provide tracking numbers for all shipments. 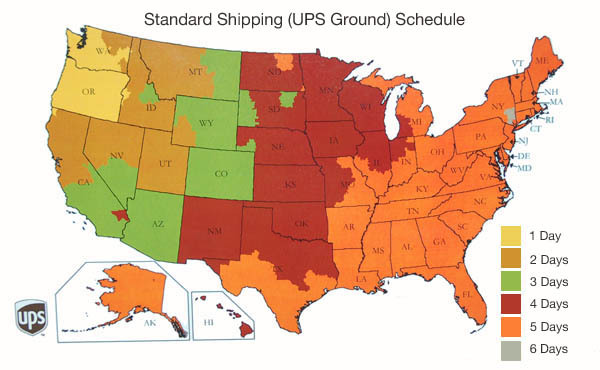 They can be tracked at ups.com or usps.com depending on your choice of shippers.